The MMS winners are, from left, Brian Keating, Diogo Corte-Real, Justin Plank, Rhyan Brode, Teddy Burke, Taylor Melton, Robert Garrett and Tim Herget. 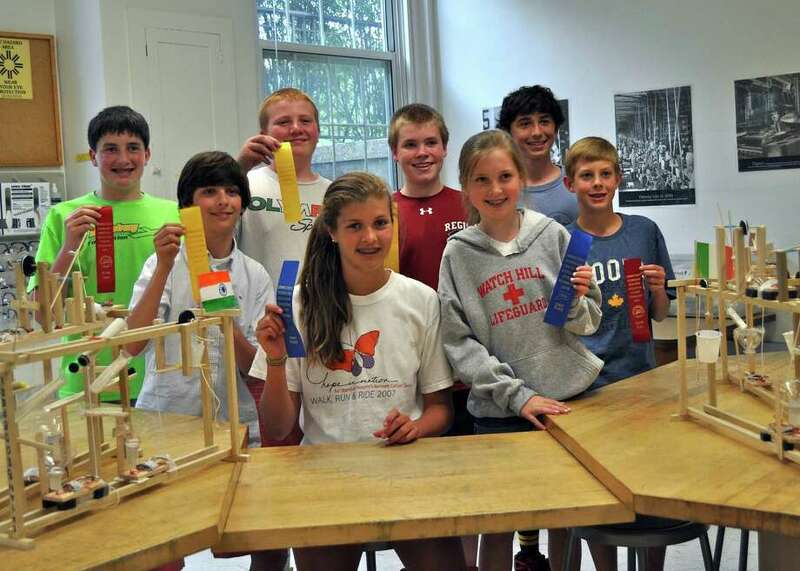 Darien, Conn.
Four Middlesex Middle School teams won first, second, and third place in an exhibition at the Connecticut Technology Education Spring Conference May 24 at Central Connecticut State University in New Britain. The students' projects, Rube Goldberg inventions, were entered in the Student Expo at the conference. The MMS seventh grade students built their Rube Goldberg inventions, Automatic Flag Poles, to meet several requirements established by their technology and engineering teacher, Lou Gerner. The students incorporated what they had learned in their classes to design the inventions to meet several specifications, such as, including at least three different simple machines and eight movable stations that would ultimately raise a flag. The Automatic Flag Pole challenge also required the students to write a report on the origin of the flag, as well as a graphic of the flag. The Middlesex winning teams were: Taylor Melton and Rhyan Brode, who won Best in Area; Tim Herget and Brian Keating, who took second place; and Teddy Burke and Diogo Corte-Real, who tied for third place with Robert Garrett and Justin Plank. Rube Goldberg (1883-1970) was a Pulitzer Prize-winning cartoonist, sculptor, author and engineer. Following his passion to be an artist, he later became famous as a newspaper illustrator/cartoonist who depicted contraptions that made a simple task more difficult, thereby mocking the current-day technology. A Rube Goldberg invention's ultimate goal is to use multiple steps to perform simple tasks.